When you start up a game of Diablo III, you’ll be able to select the difficulty level you’d like to play on. By default, Normal, Hard, and Expert are available. You’ll unlock Master difficulty when any of your characters completes the game, and Torment difficulty when any of your characters reaches level 60. 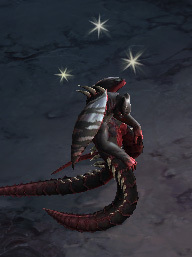 Once you’re playing, you can adjust Diablo III’s difficulty on the fly with the START button (consoles) or by opening the Game Menu (PC, default key “ESCAPE”) and selecting “LOWER DIFFICULTY” or “RAISE DIFFICULTY.” There are some limits on how far you can raise or lower Diablo III’s difficulty while playing without recreating your game. In general, monsters in higher difficulties (Hard, Expert, Master) are tougher and their attacks are more devastating. However, greater gold, experience, and item rewards await you on the higher difficulties. Ultimate Evil Edition for PlayStation®3 and Xbox 360 have difficulties Normal through Torment VI, while Playstation®4 and Xbox One include up to Torment XIII. At level 60: Life Steal is reduced by 90%. At level 70: Life Steal no longer functions. Hard Crowd Control Resistance: Hard crowd control effects—such as Stun, Blind, Charm and Fear—severely hinder the effectiveness of monsters by rendering them unable to use abilities. For every second of Hard CC suffered by a monster, it will gain 10% resistance to all Hard CC effects, stacking up to 95%. For example, if you stun a monster for 5 seconds, it will gain 50% resistance to Hard CC effects. Immediately stunning it afterwards would result in a 2.5 second stun and a total of 75% Hard CC resistance. A third attempt would result in a 1.25 second stun and even more Hard CC resistance, up to 95%. Hard Crowd Control Threshold: When a monster’s resistance increases to the point that it lowers Hard CC duration below a specific threshold (0.65 seconds for normal monsters, champions and minions and 0.85 seconds for rares and bosses), Hard CC will no longer have any effect. When a monster is no longer under the effects of Hard CC and free to use abilities, its Hard CC resistance will drop by 5% per second until it reaches 0% or encounters another Hard CC effect. Movement Slows: These effects reduce a monster’s movement speed, making them easier to evade and less likely to reach you with close-range attacks. While movement-slowing abilities can be constantly re-applied on monsters without duration penalties, Champions, Minions, Rares, and Bosses reduce the movement-slowing rate of these effects by 25%. For example, inflicting a 60% movement slow on a Boss will only reduce its movement speed by 45%. Attack Speed Slows: Attack Speed Slows diminish a monster’s attack speed, and can also be re-applied indefinitely without duration penalties. Attack Speed Slows are 100% effective against normal monsters. Champions, Minions, Rares, and Bosses reduce the effectiveness of Attack Speed Slows by 65%. Knockback: Knockback effects alter monster positioning by pushing them away from you or pulling them closer. When a monster’s Hard CC resistance reaches 65% or greater, Knockback will no longer have any affect.